How to create and market EPIC CONTENT: A Brand Bridge Solutions Epic Content Creation and Marketing Case Study. Firstly, use Ahrefs Content Explorer to find the best-performing articles based on your topic. You will get a set of articles based on the highest number of backlinks and social shares. Use the skyscraper technique on them: pick the best articles and 10x them with more value and content. Tools to use: We use the combination of Ahrefs and BuzzSumo for a holistic content research process. Go to Ahrefs – Keywords explorer – Type in the main keyword related to your topic. See and select the keywords most relevant to your topic and also keep in mind their difficulty level. Tools to use: We use Ahrefs for keyword research. You can also use a free tool like Ubersuggest to get the research done. Just enter the main keyword related to your topic and you will get a whole lot of related keywords. Write a minimum length of 1890 words. Long form content ranks much better on search engines than short form content. This is due to it being more detailed, rich in information and insights. The key thing to note: Do not force the article to be lengthy. Make it long by adding more value in the form of actionable strategies, steps, tactics, images, and insights. The article should be very value-driven and aim for the transformation of the reader. Mention relevant data related to the topic to make it more value driven. 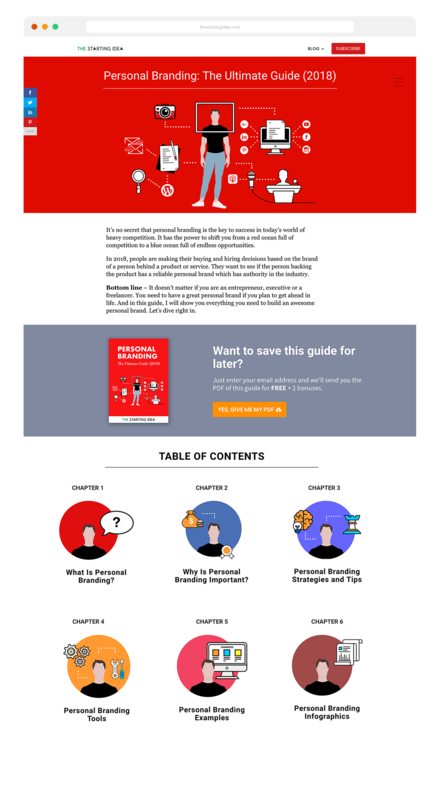 Use this 7-step process to create highly engaging and conversion-focused content. 1. Use a value-driven headline (eg. How to (insert benefit) without (insert pain), How to (insert benefit or gain) in X days/hours/mins or less). 2. Start with a curiosity-driven opener. 3. Opening loop (build anticipation right at the beginning by promising benefit, incentivizing them to read till end). 4. Easter eggs (put inside jokes, humor to build rapport). 5. 1-2 line paragraphs with a lot of whitespaces (avoid long paragraphs and jargon). 6. Aim for the transformation of the reader by giving real value. Keep seeding the content for a special bonus material (content upgrade). 7. End with CTA (call-to-action) for picking content upgrade/lead magnet. Tools to use: We use WebTextTool SEO content creation tool to write content. We also use a tool like Grammarly Premium to check our content for grammar mistakes. We use design tools like Adobe Illustrator and Adobe Photoshop to create attractive CTAs. Create design assets which depict and illustrate the crux of each chapter of the article. Tools to use: We use Adobe Illustrator to achieve this. Pick up the main points of your blog and make it into a video. Tools to use: We use Adobe After Effects and Adobe Premiere Pro to make whiteboard animation videos, text overlay videos, viral social media videos among others. All these videos are great for publishing on social sites like YouTube, Facebook, and LinkedIn. Pick up all the steps of your blog content and arrange it into actionable infographics. Tools to use: We use Adobe Illustrator for making infographics. You can also use a tool like Visme or Picktochart to create them. Create multiple content cards (social media graphics depicting the blog points in visual form) for your content piece. Tools to use: We use Adobe Spark and Stencil to create Social Media Graphics. Create a topic-specific content upgrade/lead magnet which solves a specific pain immediately and has high perceived value. Create a viral giveaway contest based on your content and set it up on the Thank You page after they sign up for the content upgrade/lead magnet. Tools to use : We use tools like Viral loops, Vyper, and KingSumo for making viral contests. Publish the article and start distributing it with “Gate Pass” method. Repurpose 70% of it on Medium and LinkedIn. Incentivize them to read the rest of the article by going through a landing page where you can collect their emails. Tools to use: We use Landingi and Kyvio for making landing pages. Publish the video natively as a Youtube video and FB native video with a link to the landing page strategically put in the video description. Repurpose the main points of the article into a SlideShare presentation with a link to the landing page. Share and promote the content on all the major social media channels wth add on copy and bullets incentivizing the reader to click on the article. Tools to use: We use Amplifr, Promo Republic and Content Studio to schedule our clients posts. We use MissingLetter for Auto-recycling of winning content. Ensure that your article gets shared on social media by using content sharing services. Tools to use: We use Quuu Promote to get our clients’ content shared by a pool of niche audiences in their industry. Copyright © 2014-2019 Brand Bridge Solutions™. All rights reserved.